Accelerate processing of your HELOC renewal loans. Over $158B of home equity lines of credit (HELOCs) will expire over the next three years. This is putting banks in the difficult position of determining how to best handle billions of dollars in home equity loans to minimize delinquency or default. Minimize your compliance and audit risk. Under new guidelines from the Office of the Comptroller of the Currency (OCC), in order to issue new terms to borrowers, banks must treat each expiring HELOC as a new loan. This means title analysis, property valuation and underwriting on thousands of home equity lines. Without proper analysis, HELOC reset process documentation and action, you could put your business at risk of failing an OCC audit. Protect your profits and resources. Your borrowers are also at risk. Consumers are facing the potential of a huge jump in monthly payments when the original terms, often interest only, of their home equity lines of credit expire. This puts you in the difficult position of determining how to best handle billions of dollars in home equity loans to minimize delinquency or default. This poses a significant challenge, but it is also an opportunity to identify and retain your best customers. You just need to do it fast, before your competition beats you to it. Accurate EquityRenew combines technology, processes and data analysis to quickly and thoroughly evaluate each HELOC, identify red flags related to title and property liens, issue an accurate, compliant market valuation and CLTV of each property, and provide you with a batch report and online dashboard to help your team take the appropriate action needed for each HELOC. Accurate Group also assigns a grade to each of your HELOC reset loans – enabling you to quickly categorize your loans for triage and appropriate action. 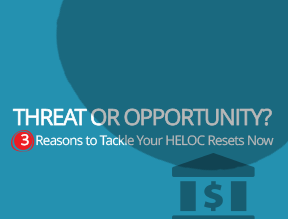 Turn the HELOC reset threat into an opportunity to improve and grow your business. Accurate Group leads the market in appraisal management, title and real estate lending compliance and is the #1 home equity valuation expert, nationwide. This expertise combined with our unique EquityRenew solution can make your HELOC renewals easier, faster and more profitable – and allow you to stay focused on growing your business. Contact Accurate Group today.